The Serbs of Bosnia and Herzegovina (Serbian: Срби у Босни и Херцеговини / Srbi u Bosni i Hercegovini) are one of the three constitutive nations (State-forming nations) of the country, predominantly residing in the political-territorial entity of Republika Srpska. In the other entity, Federation of Bosnia and Herzegovina, Serbs form the majority in Drvar, Glamoč, Bosansko Grahovo and Bosanski Petrovac. They are frequently referred to as Bosnian Serbs (Serbian: Босански Срби / Bosanski Srbi) in English, regardless of whether they are from Bosnia or Herzegovina. They are also known by regional names such as Krajišnici ("frontiersmen" of Bosanska Krajina), Semberci (Semberians), Bosanci (Bosnians), Birčani (Bircians), Romanijci (Romanijans), Posavci (Posavians), Hercegovci (Herzegovinians). Serbs have a long and continuous history of inhabiting the present-day territory of Bosnia & Herzegovina, and a long history of statehood in this territory. From the 15th to the 19th century, Orthodox Serbs in modern-day Bosnia and Herzegovina were often persecuted under the Ottoman Empire. In the 20th century, persecution by Austria-Hungary, WWII genocide, political turmoil and poor economic conditions caused more to emigrate. In the 1990s, many Bosnian Serbs moved to Serbia proper, Montenegro and Vojvodina. Having lived throughout much of Bosnia-Herzegovina prior to the Bosnian War, the majority now live in the Republika Srpska. According to the report by the Bosnia and Herzegovina statistics office, on the census of 2013 there were 1,086,733 Serbs living in Bosnia and Herzegovina. Migration of Serbs in the early 7th century. 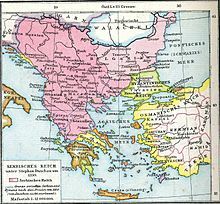 Serbs settled the Balkans in the 6th and 7th centuries. According to De Administrando Imperio (ca. 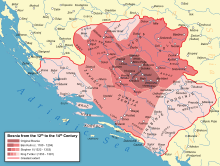 960), the Serbs had settled what is now Bosnia and Herzegovina. They inhabited and ruled Serbia, which included "Bosnia" (with two inhabited cities; Kotor and Desnik), and "Rascia", and the maritime principalities of Travunija, Zahumlje and Paganija, the first two having been divided roughly at the Neretva river (including what is today Herzegovina). Serbia was at the time ruled by the Vlastimirović dynasty. During the rule of Mutimir (r. 851-891), the Serbs were Christianized. The Serbs were important Byzantine allies; the fleets of Zahumlje, Travunia and Konavli (Serbian "Pomorje") were sent to fight the Saracens who attacked the town of Ragusa (Dubrovnik) in 869, on the immediate request of Basil I, who was asked by the Ragusans for help. Territory of Bosnia was ruled by several Serbian dynasties, almost in the entire continuity of the Middle Ages. Bosnia or most of its present-day areas were ruled by Vlastimirovic, Vojislavljevic, Nemanjic, and Kotromanic dynasties. Prince Petar (r. 892-917), defeated Tišemir in Bosnia, annexing the valley of Bosna. Petar took over the Neretva, after which he seems to have come into conflict with Michael, a Bulgarian vassal ruling Zahumlje (with Travunia and Duklja). Prince Časlav Klonimirović (r. 927-960) managed to unite all mentioned Serb territories and established a state that encompassed the shores of the Adriatic Sea, the Sava river and the Morava valley as well as today's northern Albania. Časlav defeated the Magyars on the Drina river banks when protecting Bosnia, however, he was later captured and drowned in the Sava. After his death, Duklja emerged as the most powerful Serb polity, ruled by the Vojislavljević dynasty. Constantine Bodin (r. 1081–1101) installed his relative Stefan as Ban of Bosnia. Next, the Nemanjić dynasty acquired the rule of the Serbian lands. With the establishment of the autocephalous Serbian Church, Archbishop Sava founded the Metropolitanate of Zahumlje (1217–19). The progenitor, according to Porphyrogenitos, was the prince that led the Serbs to the Balkans during the reign of Heraclius (r. 610–641) The author gives the early genealogy: "As the Serb Prince who fled to Emperor Heraclius" in the time "when Bulgaria was under the Rhōmaíōn" (thus, before the establishment of Bulgaria in 680), "by succession, his son, and then grandson, and so on, of his family rules as princes. After some years, Višeslav is born, and from him Radoslav, and from him Prosigoj, and from him Vlastimir." The time and circumstances of the first three rulers are largely unknown. It is hypothesized that &Višeslav ruled around 780, but it is unclear when Radoslav and Prosigoj would have ruled. When the Serbs were mentioned in 822 (the oldest mention of them) in the Royal Frankish Annals ("the Serbs, who control the greater part of Dalmatia"; ad Sorabos, quae natio magnam Dalmatiae partem obtinere dicitur) one of those two must have ruled Serbia. Dalmatia, in the antique period, stretched from modern-day Dalmatia far into the hinterland, northwards close to the Sava river, and eastwards to the Ibar river. Višeslav's great-grandson Vlastimir began his rule around 830, and he is the oldest Serbian ruler of which substantial data exists. The Serbs were alarmed, and most likely consolidated due to the spreading of the Bulgarian Khanate towards their borders (a rapid conquest of neighbouring Slavs), in self-defence, and possibly sought to cut off the Bulgar expansion to the south (Macedonia). Vlastimir married off his daughter to Krajina, the son of a local župan of Trebinje, Beloje, around 847–48. With this marriage, Vlastimir elevated the title of Krajina to archon. The Belojević family was entitled the rule of Travunija. Krajina had a son with Vlastimir's daughter, named Hvalimir, who would later on succeed as župan of Travunia. Vlastimir's elevation of Krajina, the practical independence of Travunija, shows, according to Živković, that Vlastimir was a Christian who understood the monarchal ideology that developed in the early Middle Ages. Serbia in the 9th and 10th century, under the rule of Vlastimirovich dynasty, compared to modern borders. Časlav takes the throne in 927, with the death of the Bulgar Khan, and immediately puts himself under Byzantine overlordship. Eastern Christian (Orthodox) influence greatly increases and the two maintain close ties throughout his regn. He enlarged Serbia, uniting the tribes of Bosnia, Herzegovina, Old Serbia, Montenegro (incorporated Pagania, Zahumlje, Travunia, Konavle, Bosnia, Rascia into Serbia, ι Σερβλια). He took over regions previously held by Michael Višević, who disappears from sources in 925. The De Administrando Imperio describes his realm: the shores of the Adriatic Sea, the Sava river and the Morava valley as well as present-day northern Albania. Chronological gradual expansion of the medieval Serb state of Bosnia. Five decades later, Jovan Vladimir emerged as the Prince of Serbs, ruling as a Bulgarian vassal from his seat at Bar. 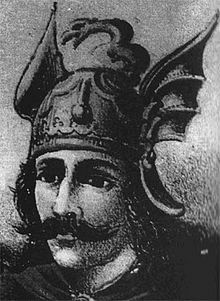 A possible descendant, Stefan Vojislav, led numerous revolts in the 1030s against the Byzantine Emperor (the overlord of the Serbian lands), successfully becoming independent by 1042. His realm included all lands earlier held by Časlav Klonimirović, and he would be eponymous to the second Serbian dynasty, the Vojislavljevići, who were based in Duklja. The latter may possibly be a branch of the Vlastimirović dynasty. A cadet branch of the Vojislavljević dynasty, the Vukanovići, emerged as the third dynasty in the 1090s. It was named for Grand Prince Vukan, who held Rascia (the hinterland) under his cousin, King of Duklja Constantine Bodin (ca. 1080–1090) in the beginning, but denounced any overlordship in 1091 when he had raided much of the Byzantine towns of Kosovo and Macedonia. The Nemanjić dynasty, the most powerful dynasty of Serbia, is founded with the emergence of Stefan Nemanja, also a descendant of the same line. Balkans in 1350 according to German historian Gustav Droysen from the 19th century. Serbian Empire at its height, including the region of Bosnia. Constantin Bodin, who ruled from 1080 to 1101. Bodin fought Byzantium and Normans further to the south, and took the town of Dyrrachium. He established vassal states in Bosnia (under Stefan) and Raška (under Vukan and Marko), which recognized his supremacy. Vukan and Marko, the new princes of Raška were probably sons of the aforementioned Petrislav. Vukan (1083–1115) was the Grand Župan while Marko headed administration of a part of the land. The Byzantine Emperor Alexios later forced Vukan to acknowledge Byzantine suzerainty in 1094. Nemanjic dynasty "for the most part, ruled mainly Herzegovina, and occasionally all parts of Bosnia, and the regions of Podrinje, Srebrenica, Posavina, Usora and Soli Stefan Dragutin (Serbian: Стефан Драгутин; died 12 March 1316) was the King of Serbia from 1276–82 and King of Syrmia (Srem) from 1282 to 1316. He ruled Serbia which included large parts of present-day Bosnia, until his abdication in 1282, when he became ill. He continued to rule the royal domains of Syrmia as King of Syrmia, and his younger brother succeeded him as ruler of Serbia. Later he became a monk and changed his name to Teokist. In the list of Serbian saints, Stefan Dragutin is venerated on either 12 November or 30 October (Old Style and New Style dates). The first Serbian Emperor also temporarily conquered most of Bosnia and included it into his Empire. The Kotromanić (Vuk's Cyrillic: Котроманић, pl. Kotromanići/Котроманићи) were members of late medieval Bosnian noble and later royal dynasties. Rising to power in the middle of the 13th century as bans of Bosnia, with control over little more than the valley of the eponymous river, the Kotromanić rulers expanded their realm through a series of conquests to include nearly all of modern-day Bosnia and Herzegovina, large parts of modern-day Croatia and parts of modern-day Serbia and Montenegro, with Tvrtko Ieventually establishing the Kingdom of Bosnia in 1377. The Kotromanić intermarried with several southeastern and central European royal houses. The last sovereign, Stephen Tomašević, ruled briefly as Despot of Serbia in 1459 and as King of Bosnia between 1461–63, before losing both countries – and his head – to the Ottoman Turks. The Battle of Bileća was fought in August 1388 between the forces of the Kingdom of Bosnia led by Duke (Voevoda) Vlatko Vuković and the Ottoman Turks under the leadership of Lala Şahin Pasha. It represents one of the first Ottoman incursions into the territory of the Serb lands of Bosnia and Herzegovina. The Ottoman army broke into Zachlumia, the kingdom's southern region. After days of looting, the invaders clashed with the defending force near the town of Bileća, ending in the latter's decisive victory. Battle of Bileca is celebrated by the Serbs of Bosnia & Herzegovina as one of their first victories against Islamic Ottoman enemy which changed the nature of their country forever. Serbs from Bosnia often helped the overall Serb struggle against Ottoman conquest of various Serbian lands. For example, Herzegovinian Voevoda Vlatko Vuković also participated in the Battle of Kosovo. In the late 14th and middle of the 15th century, the Ottoman Empire started to conquer Bosnia. In 1451 they took Vrhbosna province and conquered Bosnia in 1463. Herzegovina was conquered in 1481. As the Serbs in other areas of the Balkan Peninsula, Serbs in Bosnia and Herzegovina also resisted the Ottoman and Islamic conquest. After the fall, Serbs were subjected to various persecutions, war crimes, oppression and genocide at the hands of Muslims, including the infamous Devsirme system of forced assimilation, various Sharia inequalities, including forced labor, jizya, harsh taxation and slavery. Although their percentage in the overall population decreased, Orthodox Serbs managed to stay a relative majority in their land, and constitute a territorial majority within the territory of contemporary Bosnia, as Orthodox Serbs were traditionally a rural population within Bosnia, while Muslims were more often an urban populace, due to their services as city guards and traders. Bosnian Serbs often rebelled against Ottoman rule. The Serb Uprising of 1596–97 was suppressed at Gacko. It was a part of a broader Serb struggle against the Ottomans, in support of Austria and Venice. In 1809, Jančić's Revolt broke out in Gradiška. This revolt was a part of the Serbian Revolution, and an attempt of Serb rebels in Bosnia to connect with Serbian rebels in the Sanjak of Smederevo, and an offensive into Bosnia they initiated. In 1834, Priest Jovica's Revolt broke out in Gradiška. In 1858, Pecija's First Revolt broke out in Knešpolje. From 1815 to 1878 the Ottoman's authority in Bosnia and Herzegovina was decreasing. After the reorganization of the Ottoman army and abolition of the Jannisaries, Bosnian nobility revolted, led by Husein Gradaščević, who wanted to establish autonomy in Bosnia and Herzegovina and to stop any further social reforms. During the 19th Century, various reforms were made in order to increase freedom of religion which sharpened relations between of Catholics and Muslims in Bosnia and Herzegovina. Soon, economic decay would happen and nationalist influence from Europe came to Bosnia and Herzegovina. Since the state administration was very disorganized and the national conscience was very strong among the Christian population, the Ottoman Empire lost control over Bosnia and Herzegovina. The Serbian population in Herzegovina revolted, which led to the Herzegovina Uprising. The Ottoman authorities were unable to defeat the rebels, so Serb Principalities Serbia and Montenegro took advantage of this weakness and attacked the Ottoman Empire in 1876, soon after the Russian Empire did the same. The Turks lost the war in 1878. After the Congress of Berlin was held in same year, mandate of Bosnia and Herzegovina was transferred to the Austro-Hungarian Empire. More specifically, In 1875, the Herzegovina Uprising broke out in the Bosnia Vilayet. On July 2, 1876, Golub Babić and his 71 commanders signed the "Proclamation of the Unification of Bosnia with Serbia". This event is often known, among Serbian historians, as the "Third Serbian Uprising". This rebellion directly led to independence of Serb principalities of Motenegro and Serbia. It lasted from 1875 up to Austro-Hungarian occupation in 1878. In 1876, during this "Third Serbian Uprising" in Bosnia and Herzegovina(1875-1878), Bosnia and Herzegovina, and its Serbian people's leadership proclaimed union and annexation to Serbia("Proclamation of the Unification of Bosnia with Serbia"), under its Kniaz (Prince) Milan IV Obrenovich. The Turks lost the war in 1878. After the Congress of Berlin was held in same year, Bosnia and Herzegovina was transferred to the Austro-Hungarian Empire. During the various Balkan liberation wars (Serbian Revolution 1804-1830, Balkan Wars 1875-1878, or Balkan Wars 1912-1913 etc.) Muslim populace from all over the Balkans gradually settled the last pockets of Ottoman rule in the Balkans, one of which is Bosnia. Occupied Bosnia & Herzegovina and Serbian Principalities of Montenegro and Serbia after the Berlin Congress of 1878. Both Montenegro and Serbia, as well as the Bosnian Serbs, were dissatisfied with the decision of the Congress to allow Austro-Hungarian occupation of Bosnia & Herzegovina which were majority Serbian inhabited. In 1878, Bosnia and Herzegovina became a protectorate of Austria-Hungary, which the Serbs strongly opposed, even launching guerrilla operations against Austro-Hungarian forces. Even after the fall of the Ottoman rule, the population of Bosnia and Herzegovina was divided. Serbian politicians in the Kingdom of Serbia and the Principality of Montenegro sought to annex Bosnia & Herzegovina into a unified Serbian state and that aspiration often caused political tension with Austria-Hungary. Another ambition of Serbian politicians was to incorporate the Condominium of Bosnia and Herzegovina into the Kingdom of Serbia. The Habsburg Governor Béni Kállay resorted to co-opt religious institutions. Soon, the Austrian Emperor gained support to name Orthodox metropolitans and Catholic bishops and to choose Muslim hierarchy. At the time, Bosnia and Herzegovina was facing a Habsburg attempt at modernization. The majority were Serbs, while Muslims and Croats were a minority, and in even smaller percentages Slovenes, Czechs and others. During this period, the most significant event is Bosnian entry to European political life and the shaping of ethnic Serbs in Bosnia and Herzegovina into a modern nation. At the end of the 19th century, Bosnian Serbs founded various reading, cultural and singing societies, and at the beginning of the 20th century, a new Bosnian Serb intelligentsia played a major role in the political life of Serbs. One of the major Serbian cultural and national organizations was Prosvjeta, Bosanska Vila and Zora, among others. Serbian national organizations were focused on the preservation of Serbian language, history and culture. First Serbian Sokol societies on the present territory of Bosnia and Herzegovina were founded in the late 19th century by intellectuals. Stevan Žakula, is remembered as a prominent worker in opening and maintaining sokol and gymnastic clubs. Žakula was the initiator of the establishment of Serbian gymnastics society "Obilić" in Mostar and Sports and gymnastic society "Serbian soko" in Tuzla. Sokol societies were also established in another cities across the Bosnia and Herzegovina. In 1908, Austria-Hungary annexed Bosnia & Herzegovina, at this time majority Serb-inhabited, going against the directions of the Berlin Congress, which caused an uproar in Montenegro and Serbia. This Annexation crisis, was one of the reasons for later tensions which led to the eruption of WWI. The first parliamentary elections in Bosnia and Herzegovina were held in 1910, the winner was Serbian National Organization. On June 28, 1914, Bosnian Serb Gavrilo Princip made international headlines after assassinating Arch Duke Francis Ferdinand in Sarajevo. This sparked World War I leading to Austria-Hungary's defeat and the incorporation of Bosnia and Herzegovina into the Kingdom of Yugoslavia. During WWI, Serbs in Bosnia were often blamed for the outbreak of the war, the assassination of Archduke Franz Ferdinand, and were subjected to persecution by the Austro-Hungarian authorities, including internment and looting of their businesses, by people who were instigated to ethnic violence. Bosnian and Herzegovinian Serbs served in Montenegrin and Serbian army en masse, as they felt loyalty to the overall pan-Serbian cause. Bosnian Serbs also served in Austrian Army, and were loyal to Austria-Hungary when it came to Italian Front, but they often deserted and switched sides when they were sent to the Russian front, or to Serbian Front. Many Serbs supported the advance of fellow Montenegrin Serb Army, when it entered into Herzegovina, and advanced close to Sarajevo in 1914, as the King of Montenegro, King Nicholas I Petrovich-Njegos was very popular among Bosnian and Herzegovinian Serbs because of his pan-Serbian and Serbian nationalist views and help during Herzegovinian uprisings in the 19th century. Map showing the proposals for creation of Banovina of Serbia, Banovina of Croatia and Slovene Banovina (in 1939-1941). Most of Bosnia was to be a part of Serbia, since the Serbs were the relative majority of the Bosnian population and the absolute majority on most of the territory. After World War I, Bosnia and Herzegovina became part of the internationally unrecognized State of Slovenes, Croats and Serbs which existed between October and December 1918. In December 1918, this state united with the Kingdom of Serbia (in its 1918 borders), as Kingdom of Serbs, Croats and Slovenes,which was renamed the Kingdom of Yugoslavia in 1929. Even with around 45% Serbs living in Bosnia and Herzegovina, far more than any other group within Bosnia, Serbian leadership of the state decided to acknowledge demands of Muslim representative Mehmed Spaho, and respect the pre-war territorial integrity of Bosnia & Herzegovina, therefore not changing internat district borders of Bosnia. Bosnian Serbs constituted around a half of the total Bosnian population, but they constituted a vast territorial majority and have unilaterally proclaimed union with Serbia, for the second time in modern history, now in 1918. In total, 42 out of 54 municipalities in Bosnia & Herzegovina proclaimed union(annexation to) Serbia, without the approval of „People's Yugoslav“ government in Sarajevo, without even consulting them, in 1918. The regime of the Kingdom of Yugoslavia was characterized by limited parliamentarism, and ethnic tensions, mainly between Croats and Serbs. The state of the Kingdom became dire and King Alexander was forced to declare a dictatorship on 6 January 1929. The Kingdom was renamed into Yugoslavia, divided into new territorial entities called Banovinas. Yugoslavia was preoccupied with political struggles, which led to the collapse of the state after Dušan Simović organized a coup in March 1941 and after which Nazi Germany invaded Yugoslavia. King Alexander was killed in 1934, which led to the end of dictatorship. In 1939, faced with killings, corruption scandals, violence and the failure of centralized policy, the Serbian leadership agreed a compromise with Croats. Banovinas would later, in 1939, evolve into the final proposal for the partition of the joint state into three parts or three Banovinas, one Slovene Banovina, one Croatian and one Serbian, with each encompassing most of the ethnic space of each ethnic group. Most of the territory of contemporary Bosnia and Herzegovina was to be part of the Banovina Serbia, since most of the territory of Bosnia and Herzegovina was majority Serb-inhabited, and the Serbs constituted overall relative majority. On 24 August 1939, the president of the Croatian Peasant Party, Vladko Maček and Dragiša Cvetković made an agreement (Cvetković-Maček agreement) according to which Banovina of Croatia was created with many concessions on the Serbian side. Serbs in Dalmatia, Slavonia, Krajina and Posavina found themselves in a Croatian entity within Yugoslavia, while virtually no Croats remained in the Serbian federal entity in 1939. Most Bosnian Serbs supported federalist policies of Pribicevic during the Kingdom of Yugoslavia. During World War II, Bosnian Serbs were put under the rule of the fascist Ustaša regime in the Independent State of Croatia. Under Ustaša rule Serbs along with Jews and Roma people, were subjected to systematic genocide where hundreds of thousands of civilian Serbs were murdered. According to the US Holocaust Museum, 320,000-340,000 Serbs were murdered under Ustasha rule. According to Yad Vashem Holocaust Museum and Research Center, "More than 500,000 Serbs were murdered in horribly sadistic ways, 250,000 were expelled, and another 200,000 were forced to convert" during WWII in the Independent State of Croatia (modern-day Croatia and Bosnia). Rebellion against Axis powers occupying Yugoslavia in 1941. Rebellion broke out mostly in Serb-inhabited areas, especially in Bosnia & Herzegovina. Serbs suffered large genocide, and therefore drastic demographic shift during WWII. The official brutal policies of the Independent State of Croatia, involving expulsion, murder and forced conversion to Catholicism of Orthodox Serbs, contributed that Serbs never recover within Bosnia & Herzegovina. The Federal Bureau of Statistics in Belgrade composed a figure of 179,173 persons killed in the war in Bosnia and Herzegovina during the Second World War: 129,114 Serbs (72.1%); 29,539 Muslims (16.5%); 7,850 Croats (4.4%); others (7%). By the plans of Nazi Germany and the Independent State of Croatia 110,000 Serbs were relocated and transported to German-occupied Serbia. Just in the period of May to August 1941 over 100,000 Serbs were expelled to Serbia. In the heat of war Serbia had 200,000-400,000 Serbian refugees from Ustaša-held Bosnia and Herzegovina. By the end of war 137,000 Serbs have permanently left the territories of Bosnia and Herzegovina. Genocide in Yugoslavia, mainly committed against Serbs in "Independent State of Croatia". Serbs constituted roughly 1/3 of the territory ISC held in 1941, today Serbs are 1/8 of the population of the roughly same area. It is estimated that out of 2 000 000 Serbs living in the "Independent State of Croatia", up to 700 000 were killed. The May 1941 Sanski Most revolt against the Ustaša was suppressed in two days, and the June 1941 uprising in eastern Herzegovina was suppressed after two weeks. However, the Serbs gradually organized into two anti-fascist rebellion movements, The Chetnik Movement, and the Partisan Movement, both being dominated by fighters of Serbian origin, at least in the initial stages of combat in 1941. In June 1941, Serbs in eastern Herzegovina rebelled against the authorities of the Independent State of Croatia (Croatian: Nezavisna Država Hrvatska, NDH), an Axis puppet state established during World War II on the territory of the defeated and occupied Kingdom of Yugoslavia. As the NDH imposed its authority, members of the fascist Ustaše ruling party began a campaign of persecution of Serbs throughout the country. In eastern Herzegovina, the Ustaše perpetrated a series of massacres and attacks against the majority Serb population commencing in the first week of June. Between 3 and 22 June 1941, spontaneous clashes occurred between NDH authorities and groups of Serbs in the region. The German invasion of the Soviet Union began on 22 June. Over the next two days, the sporadic revolts by Serbs against the NDH in eastern Herzegovina erupted into mass rebellion, triggered by Ustaše persecution, Serb solidarity with the Russian people, hatred and fear of the NDH authorities, and other factors. Serb rebels, under the leadership of both local Serbs and Montenegrins, attacked police, gendarmerie, Ustaše and Croatian Home Guard forces in the region. Most of anti-fascist combat and battles were fought in mainly Serb-inhabited areas of Bosnia & Herzegovina., Like the Battle of Neretva, Battle of Sutjeska, Drvar Operation, Kozara Battle and so forth. Between 1945 and 1948, following World War II, approximately 70,000 Serbs migrated from the People's Republic of Bosnia and Herzegovina to Vojvodina after the Germans had left, which was a part of Communist policy. During the communist era, Bosnia and Herzegovina were populated by three ethnic groups: the Croats, the Serbs and the Muslims (later re-designated as Bosniaks). Many Serbs declared their nationality as Yugoslav and like all ethnic groups at the time, Serbs collaborated and were friends with their fellow citizens, whilst also maintaining their culture, primarily through their following of Serbian Orthodox Church. Many Serb scholars were subjected to persecution and false accusations of irridentism. After the government of the Republic of Bosnia and Herzegovina declared independence, which was not accepted by the federal Serb controlled government of Yugoslavia, the Serbian Autonomous Area of the Bosnian Frontier was formed in the western Bosnian Frontier region of Bosnia and Herzegovina with its capital in Banja Luka, which was not recognised by the central government. SAO Bosnian Frontier made attempts to unite with the Autonomous Region of the Serbian Frontier in Croatia. The Serb political leadership martialled its own force assisted by the Yugoslav People's Army and declared independence from Bosnia and Herzegovina in late 1992. BiH's Bosniak and Bosnian Croat dominated government did not recognize the new Serbian Republic of Bosnia and Herzegovina, whose president was Radovan Karadžić seated in Pale. The Serb side accepted the proposed ethnic cantonization of Bosnia and Herzegovina (the Carrington-Cutileiro peace plan), as did the Bosniak and Bosnian Croat sides in Lisbon in 1992, in the hope that war would not break out. The Bosniak political leadership under President Alija Izetbegović of Bosnia and Herzegovina subsequently revoked the agreement refusing to decentralize the newly created country based on ethnic lines. The Bosnian Civil War began. Among the Serb population, the war is known as the "Defensive Fatherland War". Serbs and the Army of the Serb Republic (VRS) was outnumbered, outgunned, and isolated, faced against regular Croatian Army (HV), Croatian Defense Council (HVO), mainly Muslim Army of Bosnia & Herzegovina (ABiH), forces of Autonomous Province of Western Bosnia and NATO airstrikes. Furthermore, Serbs faced weapons embargo, and sanctions from the Western countries, Russia, and even Serbia and FR Yugoslavia under Slobodan Milosevic, who instituted sanctions against the Serb Republic in 1993. Milosevic supported every single peace plan the International Community proposed, even those which did not presuppose the existence of the Serb Republic. Throughout most of the war the Bosnian Serbs fought against both the Bosniaks (Muslims) and the Bosnian Croats. During Bosniak-Croat hostilities the Serbs co-operated largely with the Croats. There were exceptions to this, however, as Serb forces were also allied with the pro-Yugoslav Bosniaks of the Autonomous Province of Western Bosnia under Fikret Abdić. Serb forces also carried out ethnic cleansing operations against non-Serbs living within their territory, the most formidable was the Srebrenica massacre in July 1995. During most of the war, Republika Srpska held around 70% of the country. During the entire length of war the Army of Republika Srpska carried out a siege of Sarajevo, allegedly in order to tie down the Bosnian forces and their resources. The siege was mostly justified with the reason of defending Sarajevo's surrounding Serb villages, which were almost exclusivelly inhabited by ethnic Serbs. Republika Srpska maintained close ties with the Republic of Srpska Krajina and received volunteers and supplies from FR Yugoslavia during the war. RS received a large number of Serb refugees from other Yugoslav hotzones, particularly non-Serb held areas in Sarajevo, Herzeg-Bosnia and Croatia. In 1993, the Owen-Stoltenberg peace treaty was suggested that would give 52% of BiH to the Serb side. It was refused by the Bosniak side as too large of a concession. In 1994, FR Yugoslavia imposed sanctions after the National Assembly of Republika Srpska refused the Vance-Owen peace plan. In 1995, Operation Storm eliminated the Republic of Serbian Krajina. The Croatian Army continued the offensive into Republika Srpska. Some 250,000 Serbs fled to Republika Srpska and Serbia from Croatia, as the Serb side continued a full retreat of Serbs from the Una to the Sana river. The Croatian Army, supported by Bosnian government forces came within 20 km of the de facto Bosnian Serb capital, Banja Luka, but were halted by Serbian defenders near Prijedor and throughout Bosnian Krajina, when their airplanes could finally fly without NATO intervention on the Croatian side. The war was halted with the Dayton Peace Agreement which recognized Republika Srpska, as one of the two territorial entities of the Bosnia and Herzegovina, comprising 49% of total territory. The Serb side suffered a total 22,779 victims - 15,298 military personnel and 7,480 civilians, according to the Demographic Unit at the ICTY. Although exact numbers are disputed, it is generally agreed that the Bosnian War claimed the lives of about 100,000 people of all ethnic groups. In 1996 there were some 435,346 ethnic Serb refugees from Federation of Bosnia and Herzegovina in Republika Srpska, while another 197,925 had gone to Serbia. According to the data of the Serbian Commissariat for Refugees, up to 1995 Serbia housed 266,000 refugees from Bosnia Herzegovina and a total of 70,000 refugees returned to the country of their origin. After the Yugoslav Wars Serbia became home to the highest number of refugees (which included Bosnian Serbs) and IDPs in Europe. Serbs massively left the capital Sarajevo in early 1996. The 2013 population census registered 1,086,733 Serbs or 30.8% of the total population of Bosnia and Herzegovina. Bosnian Serbs are the most territorially widespread nation of Bosnia and Herzegovina. The vast majority i.e. 1,001,299 live on the territory of the Republika Srpska, where they constitute 81.5% of population.Bosnian Serbs are adherents of the Serbian Orthodox Church. Serbs form a demographic majority in these municipalities: Banja Luka, Bijeljina, Prijedor, Doboj, Zvornik, Gradiška, Teslić, Prnjavor, Laktaši, Trebinje, Derventa, Novi Grad, Modriča, Kozarska Dubica, Pale, Foča, Drvar, Glamoč, Bosansko Grahovo and Bosanski Petrovac. Serbs are also a relative minority in Brčko. There were no reliable population censuses in the Middle Ages, however most of the medieval sources concerning the identity and the demographics of medieval Bosnia state that the area was continuously inhabited mainly by Serbs, who were either Orthodox by faith or followers of an Orthodox sect of Bogomil. Heading 32 of De Administrando Imperio of Constantine Porphyrogenitus, is called "On the Serbs and the lands in which they live". It speaks of the territories inhabited by Serbs in which he mentions Bosnia, specifically two inhabited cities, Kotor and Desnik, both of which are in an unidentified geographic position. Austria-Hungary pursued a demographic policy of reducing the Serbian population and trying to erase their identity, converting it to a "Bosnian nationhood", therefore, Austrian population census only had religious affiliation as a main determinism of identity. In the last Austrian census of 1910, there were 825,418 Orthodox Serbs, which constituted 43.49% of the total population. The Catholic Encyclopedia, 1917, states: "According to the census of 22 April 1895, Bosnia has 1,361,868 inhabitants and Herzegovina 229,168, giving a total population of 1,591,036. The number of persons to the square mile is small (about 80), less than that in any of the other Austrian crown provinces excepting Salzburg (about 70). This average does not vary much in the six districts (five in Bosnia, one in Herzegovina). The number of persons to the square mile in these districts is as follows: Doljna Tuzla, 106; Banjaluka, 96; Bihac, 91; Serajevo, 73, Mostar(Herzegovina), 65, Travnik, 62. There are 5,388 settlements, of which only 11 have more than 5,000 inhabitants, while 4,689 contain less 500 persons. Excluding some 30,000 Albanians living in the south-east, the Jews who emigrated in earlier times from Spain, a few Osmanli Turks, the merchants, officials. and Austrian troops, the rest of the population (about 98 per cent) belong to the southern Slavonic people, the Serbs. Although one in race, the people form in religious beliefs three sharply separated divhe Mohammedans, about 550,000 persons (35 per cent), Greek Schismatics, about 674,000 persons (43 per cent), and Catholics, about 334,000 persons (21.3 per cent). The last mentioned are chiefly peasants." Serbs suffered large negative (decreasing) demographic shift during WWII. The official policies of the Independent State of Croatia, involving expulsion, murder and forced conversion of Serbs, contributed that Serbs never recover demographically within Bosnia & Herzegovina. The Federal Bureau of Statistics in Belgrade composed a figure of 179,173 persons killed in the war in Bosnia and Herzegovina during the Second World War: 129,114 Serbs (72.1%); 29,539 Muslims (16.5%); 7,850 Croats (4.4%); others (7%). By the plans of Nazi Germany and the Independent State of Croatia 110,000 Serbs were relocated and transported to German-occupied Serbia. Just in the period of May to August 1941 over 100,000 Serbs were expelled to Serbia. In the heat of war Serbia had 200,000-400,000 Serbian refugees from Ustaša-held Bosnia and Herzegovina. By the end of war 137,000 Serbs have permanently left the territories of Bosnia and Herzegovina. Communist authorities implemented a policy of silent "demographic emptying" of Serbs from Bosnia, by dividing Serbs into several republics, causing a "brain drain" of Serbs from Bosnia to Serbia. Also, the communist policies of rapid urbanization and industrialization, devastated the traditional rural life of Serbs, causing drastic halt in natural growth of Serbs. The first Yugoslav census recorded a decreasing number of Serbs; from the first census in 1948 to the last one from 1991, the percentage of Serbs decreased from 44.29% to 31.21%, even though the total number increased. According to the 1953 census, Serbs were in the majority in 74% of the territory of Bosnia & Herzegovina, and according to the census of 2013, Serbs are the majority on over 50% of Bosnia & Herzegovina. Their total number in 1953 was 1,264,372, that is 44.40% of total Bosnian population. According to the 1961 census, Serbs made up 42.89% of total population, and their number was 1,406,053. After that, districts were divided into smaller municipalities. According to the 1971 census, Serbs were 37,19% of total population, and their number was 1,393,148. According to the 1981 census, Serbs made up 32,02% of total population, and their number was 1,320,738. After 1981, their percentage continued to reduce. From 1971 to 1991, the percentage of Serbs fell due to emigration into Montenegro, Serbia, and Western Europe. According to the 1991 census, Serbs were 31.21% of the total population, and their number was 1,366,104. The total number of Serbs in Bosnia and Herzegovina continued to reduce, especially after the Bosnian Civil War broke out in 1992. Soon, an exodus of Bosnian Serbs occurred when a large number of Serbs were expelled from central Bosnia, Ozren, Sarajevo, Western Herzegovina and Krajina. According to the 1996 census, made by UNHCR and officially unrecognized, there was 3,919,953 inhabitants, of which 1,484,530 (37.88%) were Serbs. In the territory of the Serbian Republic of Bosnia and Herzegovina, the percentage of Serbs slightly changed, although, their total number reduced. Serbs of Bosnia and Herzegovina, as well as other two constitutive nations, have their representative in the Presidency of Bosnia and Herzegovina. Presidency has three members, one Bosniak, one Croat and one Serb. Bosniak and Croat are elected in the Federation of Bosnia and Herzegovina, while Serb is elected in the Republika Srpska. The President of the Serb Republic is Željka Cvijanović. Current Serb member of the Presidency is Milorad Dodik of the SNSD. The Parliamentary Assembly of Bosnia and Herzegovina has two chambers, House of Representatives and House of Peoples. House of Peoples has 15 members, five Bosniaks, five Croats and five Serbs. Bosniak and Croat members of the House of Peoples are elected in the Parliament of the Federation of Bosnia and Herzegovina, while five Serb members are elected in the National Assembly of Republika Srpska. The 42 members of the House of Representatives are elected directly by voters, two-thirds are from the Federation while one-third is from the Republika Srpska. Currently, there are several Serbian political parties in Bosnia and Herzegovina, and Republic of Srpska. The Serbian Democratic Party (SDS), the Alliance of Independent Social Democrats (SNSD), and Party of Democratic Progress (PDP) are the most popular parties. SDS was founded in 1990 and is major political parties among Bosnian Serbs, being the most powerful during the Bosnian Civil War (1992–1995). SNSD was founded on pro-European, democratic, federalist, socialist principles, but has later on switched its tendencies into populism and pro-Russian external policies. PDP is Christian democratic, traditionalist, conservative and pro-Europeanist political party. Cultural and education society, Prosvjeta was founded in Sarajevo in 1902. It quickly became the most important organization gathering ethnic Serb citizens. In 1903 was founded Gajret, Serbian Muslim Cultural Society. Academy of Sciences and Arts of the Republika Srpska is active since 1996. Bosnia and Herzegovina is rich in Serbian architecture, especially when it comes to numerous Serbian churches and monasteries. Modern Serbo-Byzantine architectural style which started in the second half of the 19th century is not only present in the sacral but also in civil architecture. Churches and monasteries are decorated with frescoes and iconostasis. Museum of Old Orthodox Church in Sarajevo is among the five in the world by its rich treasury of icons and other objects dating from different centuries. Serbs of Bosnia and Herzegovina have made a significant contribution to modern Serbian painting. Notable painters include Miloš Bajić, Jovan Bijelić, Špiro Bocarić, Vera Božičković Popović, Stojan Ćelić, Vojo Dimitrijević, Lazar Drljača, Oste Erceg, Nedeljko Gvozdenović, Kosta Hakman, Momo Kapor, Ratko Lalić, Đoko Mazalić, Svetislav Mandić, Radenko Mišević, Roman Petrović, Ljubomir Popović, Pero Popović, Branko Radulović, Svetozar Samurović, Branko Šotra, Todor Švrakić, Mica Todorović, Milovan Vidak, Rista Vukanović. In 1907 P. Popović, Radulović and Švrakić exhibited in one of the two exhibitions that year that marked the beginnings of the modern painting tradition in Bosnia and Herzegovina. Among the sculptors prominent is Sreten Stojanović. The Serbs of Bosnia and Herzegovina speak the Eastern Herzegovinian dialect of Serbian language for which is characteristic ijekavian pronunciation. Traces of Serbian language on this territory are very old which prove old inscriptions such as Grdeša's tombstone, the oldest known stećak. One of the most important Serbian manuscripts Miroslav Gospel, was written for the Serbian Grand Prince Miroslav of Hum. Serbian language is rich with several medieval gospels written in Bosnia and Herzegovina. They are decorated with miniatures. In the early 16th century Božidar Goraždanin founded Goražde printing house. It was one of the earliest printing houses among the Serbs, and the first in the territory of present-day Bosnia and Herzegovina. Goražde Psalter printed there is counted among the better accomplishments of early Serb printers. Bosnian Serbs gave significant contribution to the Serbian epic poetry. Famous singers of the epic poetry are Filip Višnjić and Tešan Podrugović. Bosanska vila from Sarajevo and Zora from Mostar founded in the 19th century are important literary magazines. Music of Serbs in Bosnia and Herzegovina include traditional instruments such as gusle, frula, gajde, tamburica, etc. First Serbian singing societies in Bosnia and Herzegovina were set up in Foča (1885), Tuzla (1886), Prijedor (1887), Mostar and Sarajevo (1888) and other cities across the country. First concert in Bosnia and Herzegovina was held in Banja Luka in 1881. Serbian music is rich in folk songs of Serbian people in Bosnia and Herzegovina. Many songs are performed in traditional way of singing called ojkanje. Serbian singers and composers such as Rade Jovanović, Jovica Petković, Dragiša Nedović and others gave significant contribution to special type of songs called sevdalinka. Aleksa Šantić's poem Emina became one of the most known sevdalinkas. Notable performers of folk music include Vuka Šeherović, Nada Mamula, Nedeljko Bilkić, Nada Obrić, Marinko Rokvić, etc. Bosnian and Heregovians Serbs largely participated in Yugoslav pop-rock scene that was active since the end of the World War II until the break up of the country. Serbian musicians are members, and often leaders of popular bands such as Ambasadori, Bijelo Dugme, Bombaj Štampa, Indexi, Plavi orkestar, ProArte, Regina, Vatreni Poljubac, Zabranjeno pušenje. Zdravko Čolić is one of the biggest Yugoslav and Serbian music stars. Among singer-songwriters significant career made Jadranka Stojaković, Srđan Marjanović. Dušan Šestić composed national anthem of Bosnia and Herzegovina. Serbs of Bosnia and Herzegovina gave significant contribution to the folklore of Serbian people, including folk costume, music, traditional singing and instruments, epic poetry, crafts, and dances. The dresses of Bosnia are divided into two groups; the Dinaric and Pannonian styles. In Eastern Herzegovina, the folk costumes are closely related to those of Old Herzegovina. Cultural and artistic societies across the country practice folklore tradition. Serb costumes from Podgrmeč, Bosanska Krajina. Dresses from East Herzegovina (left) and urban Bosnia (right) 1875. The first education institutions of Bosnian Serbs were monasteries, of which the most significant were Dobrun, Klisina, Krupa on Vrbas, Liplje, Mostanica, Ozren, Tavna, Tvrdos, Gracanica of Herzegovina, Stuplje, Donja Bisnja, among many others throughout Bosnia & Herzegovina. The most significant people workingfor the elementary education of Bosnian Serbs in the 19th century were Jovan Ducic, Petar Kocic, and Aleksa Santic, among others, who founded and organized elementary schools throughout Bosnia and Herzegovina. Staka Skenderova established Sarajevo's first school for girls on 19 October 1858. The educational system in Ottoman era and Austro-Hungarian occupation was based on strict negation and suppression of Serbian identity. The educational system of Bosnia and Herzegovina during communism was based on a mixture of nationalities and the suppression of Serb identity. With the foundation of Serb Republic of Bosnia and Herzegovina, later simply called Serb Republic, Bosnian Serb schools took the educational system from Serbia. At the same time, University of Sarajevo, split into two, one Muslim in Western Sarajevo, and one Serbian, renamed University of East Sarajevo, with official Serbian language, the latter having most of the pre-war professors and lecturers. There is also Serbian University in Banja Luka, called University of Banja Luka. After signing the Dayton accords, jurisdiction over education in Republika Srpska was given to RS Government, while in Federation, jurisdiction over education was given to the cantons. Municipalities with Serb majority or significant minority, schools with Serbian language as official one also exist. Another education institutes are Agricultural Institute of Republic of Srpska - Banja Luka, Scientific Research Institute of University of Banjaluka, Institute of Genetic Resources in Banja Luka, Serbian Lexicographic Institute of Bosnia and Herzegovina, research Institute for Materials and Constructions of Serb Republic and Institute for Education in Banja Luka. The Serbs of Bosnia and Herzegovina are predominantly Eastern Orthodox Christians, belonging to the Serbian Orthodox Church. Serbian Orthodox Church in Bosnia and Herzegovina is organized in five subdivisions, one metropolitanate (Dabar and Bosnia), and four eparchies (Bihać and Petrovac, Banja Luka, Zvornik and Tuzla, and Zahumlje and Herzegovina). Eparchy of Zahumlje and Herzegovina, earlier The Metropolitanate of Zahumlje was founded in 1219, by Archbishop Sava, the same year the Serbian Orthodox Church acquired its autocephaly status from Constantinople. Thus, it was one of the original Serbian Orthodox bishoprics. Bosnian Serb Makarije Sokolović was the first patriarch of the restored Serbian Patriarchate, after its lapse in 1463 that resulted from the Ottoman conquest of Serbia. He is celebrated as saint. Several Bosnian Serbs are beatified in Serbian Orthodox church of which one of the most famous is Basil of Ostrog. The first Serbian high school opened in Bosnia and Herzegovina was Sarajevo orthodox seminary in 1882. On the grounds of this seminary was founded the Theological Faculty in Foča, as part of the University of East Sarajevo. Between 1866 and 1878 in Banja Luka worked theological school, while nowadays is active theological school in Foča. There are many Serbian churches and monasteries across the Bosnia and Herzegovina hailing from different periods. Each subdivision has its cathedral church and bishop's palace. Serbs of Bosnia and Herzegovina have contributed significantly to the Yugoslav and Serbian sport. First Serbian Sokol societies on the present territory of Bosnia and Herzegovina were founded in the late 19th century by intellectuals. Stevan Žakula, Croatian Serb, is remembered as a prominent worker in opening and maintaining sokol and gymnastic clubs. Žakula was the initiator of the establishment of Serbian gymnastics society "Obilić" in Mostar and Sports and gymnastic society "Serbian soko" in Tuzla. Sokol societies were also established in another cities across the Bosnia and Herzegovina. Football is the most popular sport among the Bosnian Serbs. The oldest Serb dominated Club in Bosnia and Herzegovina is Slavija Istočno Sarajevo, founded in 1908, while one of the most popular is Borac Banja Luka winner of Mitropa Cup and Yugoslav Cup. Serbian clubs participate in Premier League of Bosnia and Herzegovina and First League of the Republika Srpska which is run by Football Association of Republika Srpska. Notable players that represented Yugoslavia and Serbia include Branko Stanković, Milan Galić, Velimir Sombolac, Dušan Bajević, Boško Antić, Ilija Pantelić, Savo Milošević, Mladen Krstajić, Neven Subotić, etc. Zvjezdan Misimović served as captain of the Bosnia and Herzegovina national team from 2007 to 2012 while Ljupko Petrović led Red Star Belgrade to the Champions League trophy in 1991. The second most popular sport among Bosnian Serbs is basketball. Aleksandar Nikolić, is often referred to as, The Father of Yugoslav Basketball. He was voted two times European Coach of the Year winning three Euroleagues and two times FIBA Intercontinental Cup. Second of four fathers of Yugoslav basketball is Borislav Stanković, former general secretatary of FIBA and IOC member. Some of the players that successfully competed at the biggest world competitions are Ratko Radovanović, Dražen Dalipagić, Zoran Savić, Predrag Danilović, Vladimir Radmanović, Jelica Komnenović, Slađana Golić, Saša Čađo, Ognjen Kuzmić... KK Igokea currently plays in regional ABA League. The most famous Serbian volleyball family, Grbić family, hails from Trebinje in Eastern Herzegovina. Father Miloš was the captain of the team that won first Yugoslav medal at European championship while sons Vanja and Nikola became Olympic champions with Serbian team. Other players that represented Serbia with success are Đorđe Đurić, Brankica Mihajlović, Tijana Bošković, Jelena Blagojević, Sanja and Saša Starović. Besides team sports, Bosnian Serbs achieved success and in individual sports such as Slobodan and Tadija Kačar in boxing, Radomir Kovačević, Nemanja Majdov and Aleksandar Kukolj in judo, Milenko Zorić in canoeing, Velimir Stjepanović in swimming, Andrea Arsović in shooting, Andrea Petkovic in tennis, Draženko Mitrović in paralympic athletics, etc. ^ a b Sarajevo, juni 2016. CENZUS OF POPULATION, HOUSEHOLDS AND DWELLINGS IN BOSNIA AND HERZEGOVINA, 2013 FINAL RESULTS (PDF). BHAS. Retrieved 30 June 2016. ^ "Vladimir Corovic: Istorija srpskog naroda". Rastko.rs. Retrieved 9 October 2017. ^ The early medieval Balkans, pg. 149. ^ a b c d Ivić et. al 1987, pg. 21. ^ Fine 1991, pg. 141. ^ a b Runciman 1930, ch. 2, n. 88. ^ a b Bury 2008, pg. 372. ^ Fine 1991, pp. 108–10. ^ a b Ćorović 2001, ch. 2, III. ^ Fine 1991, pg. 110. ^ a b Živković 2006, pg. 17. ^ Živković 2006, pg. 18. ^ Herb & Kaplan 2008, p. 1529. ^ İçduygu, Ahmet; Sert, Deniz (2015). Migration in the Southern Balkans. IMISCOE Research Series. Springer, Cham. pp. 85–104. doi:10.1007/978-3-319-13719-3_5. ISBN 9783319137186. ^ "Wikimedia Commons". Commons.wikimedia.org. Retrieved 4 January 2018. ^ "Političko predstavljanje BiH u Kraljevini Srba, Hrvata i Slovenaca / Kraljevini Jugoslaviji (1918.–1941.)". Parlament.ba. Retrieved 2017-12-09. ^ a b c "Independent State of Croatia" (PDF). Yad Vashem World Holocaust and Research Documentation Center. ^ Zwierzchowski, Jan & Tabeau, Ewa (1 February 2010). "The 1992–95 War in Bosnia and Herzegovina: Census-based multiple system estimation of casualties undercount" (PDF). Households in Conflict Network and the German Institute for Economic Research. Retrieved 17 May 2015. ^ UNESCO (1998). "Review of the education system in the Republika Srpska". Retrieved 10 January 2009. ^ B92 (2013). "Serbia has highest number of refugees in Europe". Retrieved 29 January 2017. ^ "U Srbiji živi 9.080 izbjeglica iz BiH". 2016. Retrieved 29 January 2017. ^ "Serbia home to highest number of refugees and IDPs in Europe". B92. 20 June 2010. ^ "Serbia: Europe's largest proctracted refugee situation". OSCE. 2008. ^ a b "Serbs, Bosnia and national identity". cafehome.tripod.com. Retrieved 2017-12-09. 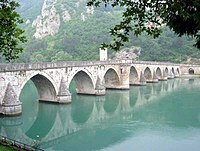 ^ "CATHOLIC ENCYCLOPEDIA: Bosnia and Herzegovina". Newadvent.org. Retrieved 2017-12-09. ^ Robbers 2006, p. 117. ^ "NATO - Topic: Signatures of Partnership for Peace Framework Document (country, name & date)". ^ "Magacinportal.org". Magacinportal.org. Retrieved 9 October 2017. ^ "Muzički život Srba u Bosni i Hercegovini (1881—1914)". Riznicasrpska.net. Retrieved 9 October 2017. ^ "O kulturnom i društvenom životu stare Banje Luke (5)". Glassrpske.com. Retrieved 4 January 2018. ^ "The Legacy of the Despić Family". Sarajevo.travel. Retrieved 9 October 2017. Bataković, Dušan T. (1996). The Serbs of Bosnia & Herzegovina: History and Politics. Paris: Dialogue. ISBN 9782911527104. Ćorović, Vladimir. Crna knjiga: patnje Srba Bosne i Hercegovine za vreme svetskog rata 1914-1918. Jugoslovenski dosije, 1989. Cvijić, Jovan (1908). Анексија Босне и Херцеговине и српски проблем. Државна штампарија. Đukanović, Dragan. "Položaj Srba u postjugoslovenskim državama." Nova srpska politička misao 15.3+ 4 (2007): 367-379. Mileusnić, Slobodan (1997). Spiritual Genocide: A survey of destroyed, damaged and desecrated churches, monasteries and other church buildings during the war 1991-1995 (1997). Belgrade: Museum of the Serbian Orthodox Church. Nilević, Boris (1990). Srpska pravoslavna crkva u Bosni i Hercegovini do obnove Pećke patrijaršije 1557. godine. Veselin Masleša. Papić, Mitar (1978). Istorija srpskih škola u Bosni i Hercegovini. Veselin Masleša. Pejanović, Mirko (1999). Bosansko pitanje i Srbi u Bosni i Hercegovini. Bosanska knjiga. Petranović, Bogoljub, and Novak Kilibarda. Srpske narodne pjesme iz Bosne i Hercegovine: Junačke pjesme starijeg vremena. Svjetlost, 1870. Dikica Stanisavljević (2006). Svedočenja o stradanju Srba iz Bosne i Hrvatske. Vardenik. ISBN 978-86-84487-04-1.